In January, 2017 National Audubon Society (NAS) turned over ownership of the Hunt Hill Audubon Sanctuary property to the Friends of Hunt Hill Audubon Sanctuary (FOHHAS). This transfer has been a long range goal of FOHHAS since their incorporation in 1990. The transfer frees FOHHAS from constraints and uncertainty of leasing a property and allows the organization to focus on their future and growth. To read more of the history on the NAS-FOHHAS relationship, check out our History Page. Property outlined in red and yellow represent FOHHAS property. 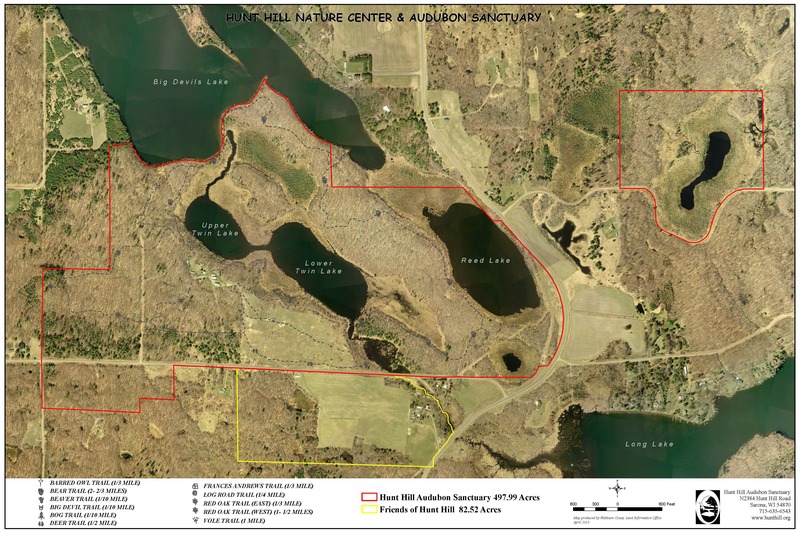 The Friends of Hunt Hill, in partnership with the National Audubon Society, closed on an additional 25 acres of land south of Hunt Hill Road. Work began on the purchase of the property in 2014. The new land is an addition to the original Hunt Hill property and owned by National Audubon Society. Currently there are no trails on the property. Thanks to support from donors, including the Grand Foundation, the local Friends of Hunt Hill Audubon Sanctuary, Inc. purchased 83 acres of land adjoining the original Audubon Sanctuary! Since the purchase, the property has been cleaned up, the old barn was stabilized, trees were planted along Pepper Creek to restore a buffer zone, a trail system is being developed and a new steel roof was put on the garage. The Friends are currently identifying options for the site’s future use. Aerial photo of 83 acre Seever property (inside yellow line), formerly known as the “Miniature Horse Farm,” being acquired by the Friends of Hunt Hill. It is located across Audubon Road, just south of Hunt Hill Prairie, with a portion fronting on County M (on right side of photo). The farm field in the center of the photo has served as Prairie Fling parking. Pepper Creek flows out of Hunt Hill’s Twin Lakes and into Long Lake along the east, or right-hand, side of the Seever property.